DAVE RAYBURN: THE ECLIPSE SESSIONS comes four years after your last album, 2014’s TERMS OF MY SURRENDER. It’s your longest stretch in between albums, but it’s also under the shade of your longest standing relationship with a label. Why did album number twenty-three take so long to come about, and how have the last fifteen years been with New West Records? JOHN HIATT: Well, I finished touring TERMS OF MY SURRENDER in 2015 and I just really didn’t know where to go next. Frankly, I was getting older and I didn’t know quite what to write about. After fifteen years straight of touring, with very few breaks, I needed more time at home. It just took me a minute to get my bearings. And I didn’t write a song for about two years, 2015-2016. And then the songs just started coming. I have enjoyed working with New West over the last fifteen years, we have a good relationship. 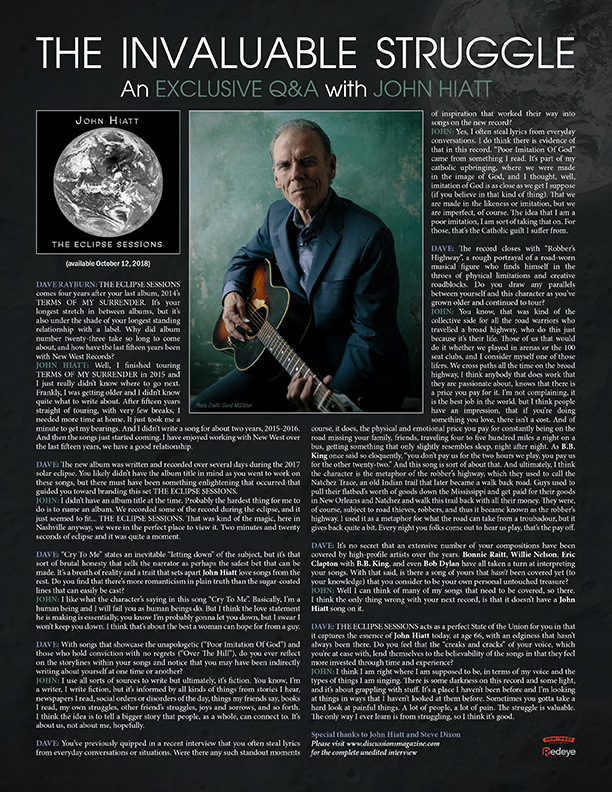 DAVE: The new album was written and recorded over several days during the 2017 solar eclipse. You likely didn’t have the album title in mind as you went to work on these songs, but there must have been something enlightening that occurred that guided you toward branding this set THE ECLIPSE SESSIONS. JOHN: I didn’t have an album title at the time. Probably the hardest thing for me to do is to name an album. We recorded some of the record during the eclipse, and it just seemed to fit... THE ECLIPSE SESSIONS. That was kind of the magic, here in Nashville anyway, we were in the perfect place to view it. Two minutes and twenty seconds of eclipse and it was quite a moment. DAVE: “Cry To Me” states an inevitable “letting down” of the subject, but it’s that sort of brutal honesty that sells the narrator as perhaps the safest bet that can be made. 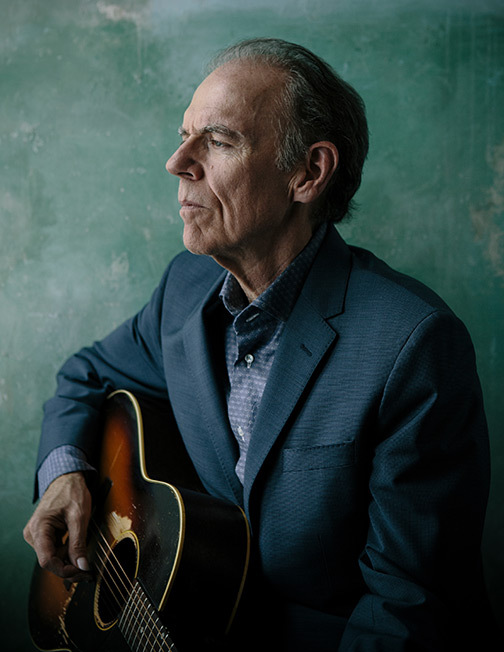 It’s a breath of reality and a trait that sets apart John Hiatt love songs from the rest. Do you find that there’s more romanticism in plain truth than the sugar-coated lines that can easily be cast? JOHN: I like what the character’s saying in this song “Cry To Me”. Basically, I’m a human being and I will fail you as human beings do. But I think the love statement he is making is essentially, you know I’m probably gonna let you down, but I swear I won’t keep you down. I think that’s about the best a woman can hope for from a guy. DAVE: With songs that showcase the unapologetic (“Poor Imitation Of God”) and those who hold conviction with no regrets (“Over The Hill”), do you ever reflect on the storylines within your songs and notice that you may have been indirectly writing about yourself at one time or another? JOHN: I use all sorts of sources to write but ultimately, it’s fiction. You know, I’m a writer, I write fiction, but it’s informed by all kinds of things from stories I hear, newspapers I read, social orders or disorders of the day, things my friends say, books I read, my own struggles, other friend’s struggles, joys and sorrows, and so forth. I think the idea is to tell a bigger story that people, as a whole, can connect to. It’s about us, not about me, hopefully. DAVE: You’ve previously quipped in a recent interview that you often steal lyrics from everyday conversations or situations. Were there any such standout moments of inspiration that worked their way into songs on the new record? JOHN: Yes, I often steal lyrics from everyday conversations. I do think there is evidence of that in this record. “Poor Imitation Of God” came from something I read. It’s part of my catholic upbringing, where we were made in the image of God, and I thought, well, imitation of God is as close as we get I suppose (if you believe in that kind of thing). That we are made in the likeness or imitation, but we are imperfect, of course. The idea that I am a poor imitation, I am sort of taking that on. For those, that’s the Catholic guilt I suffer from. DAVE: The record closes with “Robber’s Highway”, a rough portrayal of a road-worn musical figure who finds himself in the throes of physical limitations and creative roadblocks. Do you draw any parallels between yourself and this character as you’ve grown older and continued to tour? JOHN: You know, that was kind of the collective side for all the road warriors who travelled a broad highway, who do this just because it’s their life. Those of us that would do it whether we played in arenas or the 100 seat clubs, and I consider myself one of those lifers. We cross paths all the time on the broad highway, I think anybody that does work that they are passionate about, knows that there is a price you pay for it. I’m not complaining, it is the best job in the world, but I think people have an impression, that if you’re doing something you love, there isn’t a cost. And of course, it does, the physical and emotional price you pay for constantly being on the road missing your family, friends, traveling four to five hundred miles a night on a bus, getting something that only slightly resembles sleep, night after night. As B.B. King once said so eloquently, “you don’t pay us for the two hours we play, you pay us for the other twenty-two.” And this song is sort of about that. And ultimately, I think the character is the metaphor of the robber’s highway, which they used to call the Natchez Trace, an old Indian trail that later became a walk back road. Guys used to pull their flatbed’s worth of goods down the Mississippi and get paid for their goods in New Orleans and Natchez and walk this trail back with all their money. They were, of course, subject to road thieves, robbers, and thus it became known as the robber’s highway. I used it as a metaphor for what the road can take from a troubadour, but it gives back quite a bit. Every night you folks come out to hear us play, that’s the pay off. DAVE: Having amassed an impressive songwriting catalog over a four-plus decade solo career, what’s your criteria for selecting songs that make it into the set lists each time you go out on the road? Are there ways that you try to keep it fresh for yourself? JOHN: I try to mix it up as far as picking songs to play for an upcoming trip. It depends on the various tours, if I’m supporting a new record and out with a band, I try to play a fair amount of new mixed in with a rotating group of oddballs and favorites. This fall for example I’m touring behind a new release but I’m touring solo which makes for a much bigger group of songs I can choose from on a given night, since I am only limited by what I may have to brush up on, day of show. DAVE: On the same topic, you recently offered up a 30th anniversary celebratory tour in honor of the 1988 SLOW TURNING album. With such a multi-faceted and much-revered catalog could this sort of retrospective look back possibly affect what audiences may see from you in the future? JOHN: In terms of retrospect, I don’t know. The tour was a lot of fun, we got the old Goners band back together. Sonny Landreth on guitar, Dave Ranson on bass, and Kenny Blevins on drums. We played SLOW TURNING top-to-bottom, which is something I had never done before, and added some stuff as well. We just had a wonderful time, so who knows in the future, maybe. 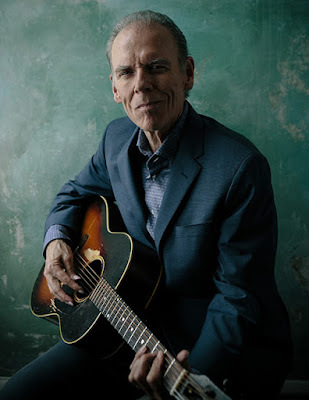 DAVE: The demo sessions for that record (SLOW TURNING) featured an entirely different set of players including Dave Mattacks (Fairport Convention), David Lindley (Jackson Browne) and John Doe (X). How did that unique, one-off lineup originate and why did you ultimately decide to go a different direction? JOHN: The producer of BRING THE FAMILY, John Chelew, that was his suggestion for the next recording project. We brought it to the studio and spent three or four days working and there were some magical moments, but I just didn’t feel like it captured what I was looking for. That’s when we decided, actually David, head of A&R at A&M at the time, suggested I get together with Glyn Johns (the great British producer that worked with everyone from the Beatles to the Rolling Stones and Led Zeppelin). That is how SLOW TURNING came about. DAVE: There’s a very loyal pocket of your fan at base that is known for collecting and trading rare and unreleased bootleg recordings of both live and studio work. As more and more artists embrace the past in regard to new appealing merchandise, would you consider an ongoing series of archival releases that would make certain gems from the past available directly to fans (for example, the aforementioned “lost” SLOW TURNING sessions)? JOHN: We’re gonna be puttin’ out some odds and sods from over the years in the next 12-18 months. DAVE: It’s no secret that an extensive number of your compositions have been covered by high-profile artists over the years. Bonnie Raitt, Willie Nelson, Eric Clapton with B.B. King, and even Bob Dylan have all taken a turn at interpreting your songs. With that said, is there a song of yours that hasn’t been covered yet (to your knowledge) that you consider to be your own personal untouched treasure? JOHN: Well I can think of many of my songs that need to be covered, so there. 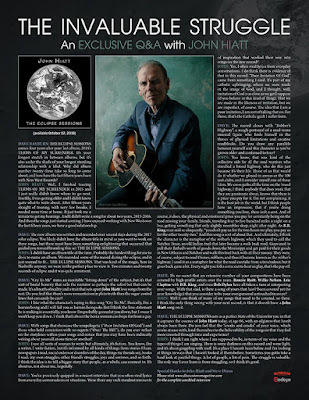 I think the only thing wrong with your next record, is that it doesn’t have a John Hiatt song on it. 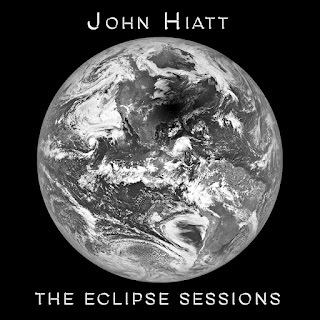 DAVE: THE ECLIPSE SESSIONS acts as a perfect State of the Union for you in that it captures the essence of John Hiatt today, at age 66, with an edginess that hasn’t always been there. Do you feel that the “creaks and cracks” of your voice, which you’re at ease with, lend themselves to the believability of the songs in that they feel more invested through time and experience? JOHN: I think I am right where I am supposed to be, in terms of my voice and the types of things I am singing. There is some darkness on this record and some light, and it’s about grappling with stuff. It’s a place I haven’t been before and I’m looking at things in ways that I haven’t looked at them before. Sometimes you gotta take a hard look at painful things. A lot of people, a lot of pain. The struggle is valuable. The only way I ever learn is from struggling, so I think it’s good.